The Rockbox Christmas Show lights up your holiday with the regular professional cast of entertainers performing the best-loved songs of the season and Christmas hits from your favorite decade. 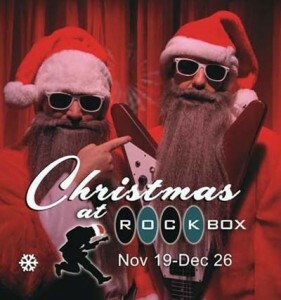 With weekly shows throughout the year as TripAdvisor’s #1 rated Attraction in Texas, Rockbox turns Christmas top to bottom with weekly Christmas showtimes, November 19 – December 26. New this year…weekly Guest Artists join the Christmas cast to add to the fun. You can add Rockbox Tickets when you make your reservation online. Just add a note to tell us what show you would like to attend.